Box.com unveiled OneCloud today--a new service designed to unite the data from various mobile apps. Box OneCloud promises to make it easier to manage data on mobile devices and be productive from virtually anywhere. 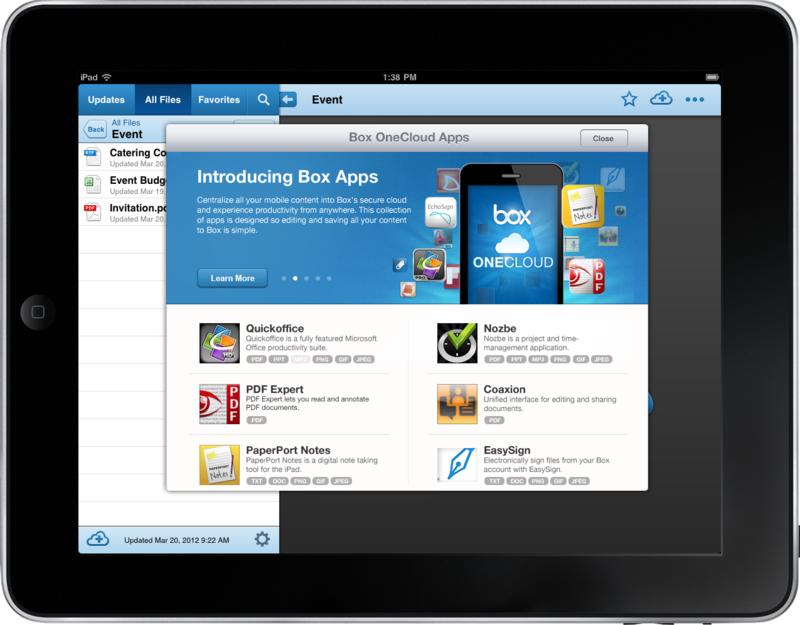 OneCloud resolves a fundamental limitation of the Apple iPad, and makes Box a must-have app. OneCloud is a cloud-based framework that brings all of the data together in one place. Box is launching OneCloud with support for 30 apps, including four premier apps that offer deeper integration with Box. Users can securely access, edit, and share content across a variety of apps from a mobile device. Box with OneCloud addresses one of the biggest iPad limitations and makes Box a must-have app. The four premier apps are QuickOffice, PDF Expert, PaperPort Notes, and EchoSign. Box has dubbed these four apps “premier” because it believes they represent best-in-class app solutions. What really makes them “premier”, though, is that they provide a “round-trip” experience that lets you open files from Box, use them within the app, and save them back their original location on Box. When you are working with a file within the Box app you will now see a cloud icon on the top menu. Tapping the cloud opens a dropdown list of the apps available to use with the given file type. There is also a button to view the gallery of apps to find and install new apps that work with your file, and are compatible with Box OneCloud. You can also create new files directly from the Box app using apps compatible with OneCloud. The Apple iPad is a great tool for getting things done on the go. For business users, though, the way the iPad, and iPad apps handle data can be a problem. It is a challenge to try and work with a file that was created in another app because there’s no shared storage, and no means of sharing the information from one app to the next in most cases. I spoke last week with Box.com VP of Platform Development Matthew Self, and he pointed out that data on the iPad is housed in various app-centric silos. Without a centralized local file system, you end up with files and data scattered across the iPad, housed within their associated apps. According to Box, though, OneCloud can solve all of that. With OneCloud, the Box app is no longer just a Box app. Now the Box app is a data management and mobile productivity hub of the iPad. The combination of Box and OneCloud could make the iPad a much more powerful mobile business device. OneCloud is available immediately for iOS, and coming soon for Android mobile devices.